Today is the birthday (1846) of Kicking Bear, also called Matȟó Wanáȟtaka, an Oglala Lakota who became a band chief of the Miniconjou Lakota Sioux. 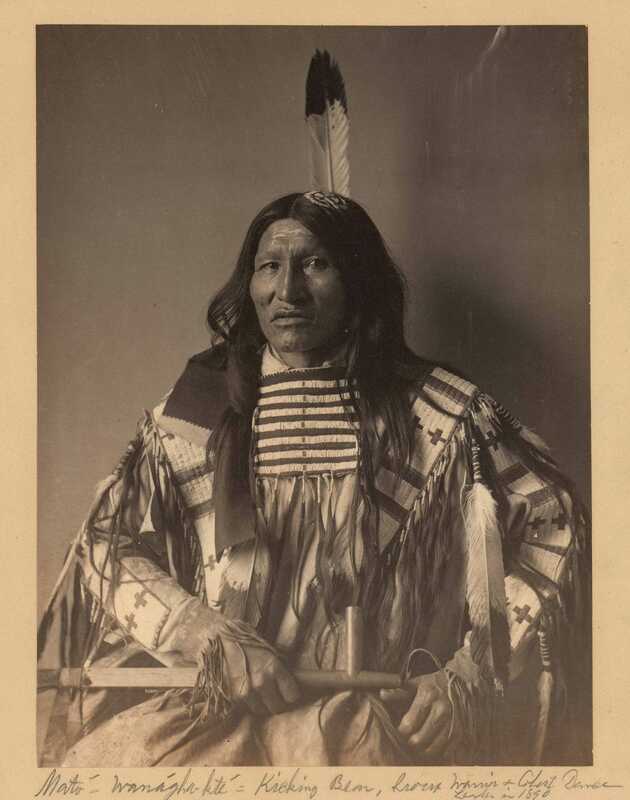 He fought in several battles with his brother, Flying Hawk and first cousin, Crazy Horse during the War for the Black Hills, including Battle of the Greasy Grass (Little Bighorn). 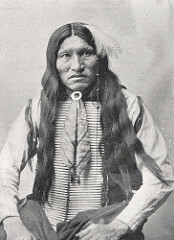 Kicking Bear was one of the five warrior cousins who sacrificed blood and flesh for Crazy Horse at the Last Sun Dance of 1877. The ceremony was held to honor Crazy Horse one year after the victory at the Battle of the Greasy Grass, and to offer prayers for him in the trying times ahead. 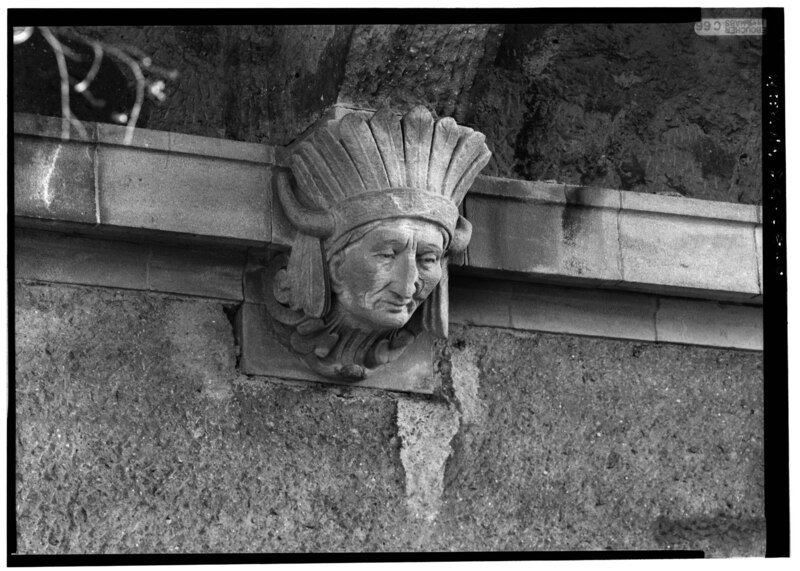 Crazy Horse attended the Sun Dance as the honored guest but did not take part in the dancing. The five warrior cousins were brothers Kicking Bear, Flying Hawk and Black Fox II, all sons of Chief Black Fox, also known as Great Kicking Bear, and two other cousins, Eagle Thunder and Walking Eagle. 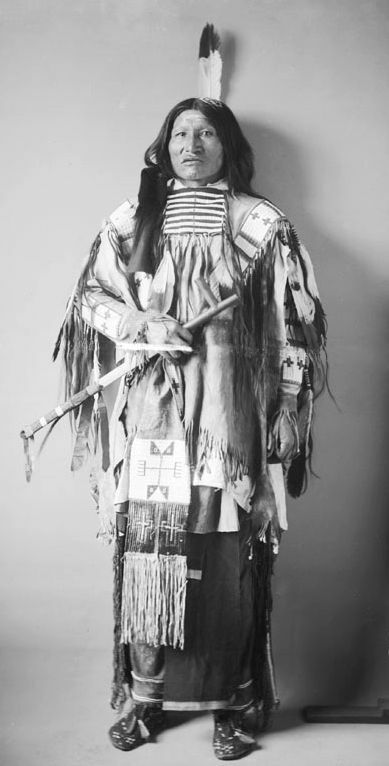 Kicking Bear was also a holy man active in the Ghost Dance religious movement of 1890, and had traveled with fellow Lakota Short Bull to visit the movement’s leader, Wovoka (a Paiute holy man living in Nevada). The Lakota men were instrumental in bringing the movement to their people who were living on reservations in South Dakota. Following the murder of Sitting Bull, Kicking Bear and Short Bull were imprisoned at Fort Sheridan, Illinois. Upon their release in 1891, both men joined Buffalo Bill Cody’s Wild West Show, and toured with the show in Europe, although they found the experience humiliating. After a year-long tour, Kicking Bear returned to the Pine Ridge Reservation to care for his family. In March 1896, Kicking Bear traveled to Washington, D.C. as one of three Lakota delegates taking grievances to the Bureau of Indian Affairs. He made his feelings known about the drunken behavior of traders on the reservation, and asked that Native Americans have more ability to make their own decisions. While in Washington, Kicking Bear agreed to have a life mask made of himself. The mask was to be used as the face of a Sioux warrior to be displayed in the Smithsonian Institution’s National Museum of Natural History. Kicking Bear painted his account of the Battle of Greasy Grass at the request of artist Frederic Remington in 1898, more than twenty years after the battle. Kicking Bear was buried with the arrowhead as a symbol of the ways he so dearly desired to resurrect when he died on May 28th, 1904. His remains are buried somewhere in the vicinity of Manderson-White Horse Creek. Wohanpi has been a classic Lakota dish for centuries, but there is not really much to give in the way of a recipe because in its traditional form it is made from what you might expect: hunted meat and gathered vegetables. It could be made with bison, elk, or the like, with wild onions and timpsula (wild turnip). You get the idea. These days, Lakota cooks may make it with beef, potatoes, and carrots yet still call it wohanpi. 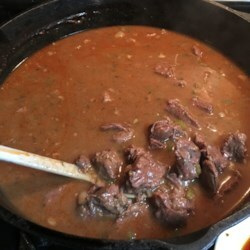 A version made with beef, potatoes, and carrots would certainly be symbolic of what has happened to the Lakota over the years, but if you want to truly celebrate Kicking Bear you might try to get some bison, elk, or deer meat, and simmer it (cubed) for several hours along with whatever vegetables indigenous to North American you can find – preferably wild. That’s something of a challenge, but it can be done. There are sites such as this one https://siouxtrading.com/tinpsila/ for example. Good Hunting.